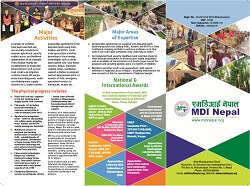 MDI-Nepal which stands for Manahari Development Institute-Nepal (MDI-Nepal) is a well established NGO in Nepal. The organization was established in September 19, 2001 with contemporary groups of professional staffs working in different NGO sectors. The organization is steered by nine board of directors of whom four are women. The organization has 50 qualified staffs working in different project districts. Registered in district administration office of Makawanpur (Regd. No. 744/057/58) and affiliated with Social Welfare Council (SWC affiliation number 13918), Kathmandu, MDI-Nepal has proven its strength to improve the livelihoods of rural poor primarily through interventions in agricultural, environment and water sectors. While the institution has multiple sector programs the main priority always has been the food and income security to the vulnerable and disadvantaged community of the rural society. MDI has acquired substantial experience in improving crop productivity of rain-fed farm lands through technical support in farming practice and development of small scale irrigation systems. Innovative water acquisition and application technologies such as water harvesting tank (WHTs), infiltration galleries, and drip and sprinklers have been introduced. This organization is one of the champions to manage sloping uplands (shifting cultivation or slash and burn farming area) through terracing and cultivation of high value crop along with the water harvesting technologies. It has assisted nearly 5000 rural farmers to escape from the poverty and food insecurity by proper utilization of the land and water. MDI has also facilitated in the establishment of sustainable local institutions working in good governance. MDI believes that poor, given some outside support can create capital and use it efficiently to improve their quality of life and achieve self-reliance. Land and labor being the primary asset of poor, sustainable agriculture development should be the core intervention for their improvement in food security and income.